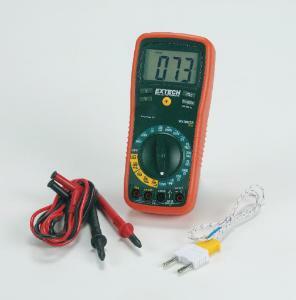 8 Function Professional MultiMeter with manual ranging DMM with large digit LCD display and temperature function. This meter measures AC/DC Voltage, AC/DC Current, Resistance, Diode Test, and Continuity plus Thermocouple Temperature. Easy to read large backlit display. Input fuse protection and miss-connection warnings with audible and visible signals. Ergonomically designed to fit comfortably in your hand.